Note: It is hard to believe that it is 2017 and hard to believe that it has now been over a year since I blogged consistently. Here’s my first attempt at blogging monthly this year! It was a good reflective practice for me and I want to get back into it. Enjoy! In 2015 I started my one word tradition with mindfulness, and it really guided my habits to make me a more mindful person. In 2016, I chose wander and although I never got around to blogging about it, I did enjoy being a little more adventurous and maybe I can recap it in a future blog post. 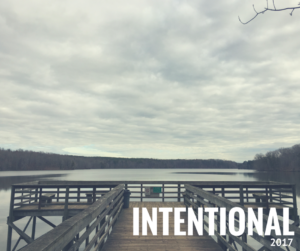 It was not easy to pick one word to guide my actions and focus in 2017. The past year has been exciting and full of challenges. I was promoted at Elon into a new job that I love and started supervising full-time staff for the first time. I taught a section of Elon’s first year seminar (Elon 101). I accepted a bigger leadership position in the Junior League of Greensboro that takes up a lot of my time (but is also a lot of fun!). I am dealing with an injury and can not run as much as I used to, but I picked up a new workout routine (Kayla Itsines BBG) that brings me a ton of happiness. I have this habit of doing the most; of doing everything. I am filling my days with things that make me happy, things that make me smile, things that make others happy, things that I hope are making a difference, BUT when I sat down to really think about all I have accomplished and all that I do, I wondered: am I doing all of these things with purpose?